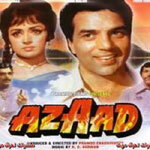 "Azaad" is a 1978 hindi film which has Dharmendra, Hema Malini, Nirupa Roy, Ajit, Prem Chopra, Om Shiv Puri, Bhagwan, Birbal, Shoma Anand, Abhi Bhattacharya, Mohan Choti, Pinchoo Kapoor, Viju Khote, Lalita Kumari, Keshto Mukherjee and Sulochana Latkar in lead roles. We have 3 songs lyrics and 3 video songs of Azaad. R. D. Burman has composed its music. Kishore Kumar and Lata Mangeshkar have sung these songs while Anand Bakshi has penned its lyrics.